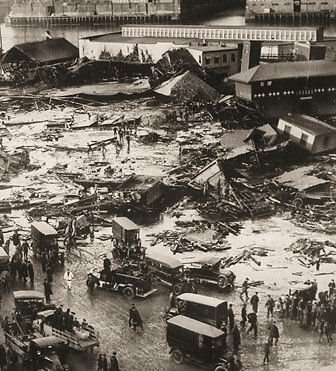 Friends: It’s that day again … the anniversary of the Great Molasses Flood of 1919, a.k.a. one of my favorite days of the year. (No kidding.) Rather than write the same old blog post again, I’ll link to my original post about the flood, where I explained why this day means so much to me. You know, it’s funny. I’ve been keeping this blog since September 2005, and in the four years that this day has come along, there has only been one where I remembered on my own, on time. (To wit, here are my posts from 2006, 2007, 2008, and 2009.) Today, were it not for Universal Hub and his Tweet, I would have totally forgotten again. So thanks to Adam over at UHub and Happy Molasses Flood Day to the rest of you! Kids! I’ve nearly let the entire day go by without acknowledging the 90th anniversary — 90th! 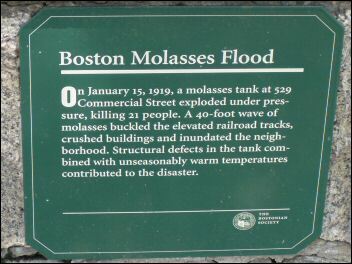 — of one of my favorite days of the year: January 15, 1919, the day of the Great Molasses Flood. For such an important day, I sure do have a habit of forgetting when it is, but this year I’m going to get a post in just under the wire. If you know nothing about the flood, check out my post from three years ago. For even more, check out the book Dark Tide (yeah, no kidding). the scent of molasses — now run like hell! Each year, we recite it and laugh ourselves silly. We did it this evening, in fact. Eventually, we’ll also finish our big-screen adaptation of the Dark Tide book (appropriately, we’re working verrrrrrrrry slowly). But for now, a happy anniversary to the flood. I’m going to mark this down on my calendar so I don’t almost forget it again next year. This year I’m right on schedule. Finally. For the first time in the three years I’ve been keeping this blog, I’m actually going to have a post up about the Great Molasses Flood of 1919 on the actual anniversary day, which is tomorrow, January 15. Longtime readers of this blog know that this is one of my all-time favorite stories, historical or otherwise. 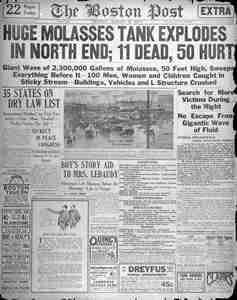 Basically, if you’ve never heard of it before, 89 years ago, a huge tank of molasses — we’re talking 50 feet tall and 240 feet wide — exploded, spilling 2.5 million gallons of molasses into Boston’s North End. But it didn’t just spill. It did so in the form of a wave about 10 feet tall that moved at a speed of 35 mph and exerted a pressure of 2 tons/foot. Years later, a book about the subject was written and it was called, of all things, Dark Tide. Sure, it’s a tragic story (21 people were killed and 150 were injured) but don’t you just love the visual of a giant wave of molasses plowing its way through the North End? Classic stuff right there. We’re also working (verrrry slowly) on a movie adaptation of the Dark Tide book. Anyone want to produce it? For more about the flood, click here to read my post from two years ago. I’ll be eating a molasses cookie in honor of this special day. You should too. Happy anniversary! 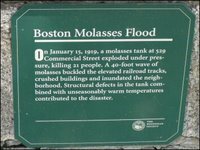 For the second year in a row, I forgot to mention the Great Molasses Flood on the actual anniversary day, which was Monday. 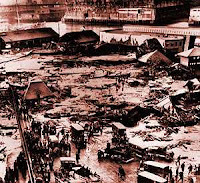 If you’ve never heard the story of the molasses flood of 1919, then you simply must read my post from a year ago, which provides a summary and links to other articles with more details. Suffice it to say, it’s one of my favorite Boston history stories of all time. I mean, it inspired a book called Dark Tide! How great is that? Anyway, happy anniversary, Boston. I’ll eat a molasses cookie in your honor. Back in the day, molasses was the standard sweetener across the country, used in things like soda, etc. (these days it’s corn syrup). Molasses was also fermented and used in producing ethyl alcohol for use in making liquor and as a key component in the manufacture of munitions. Right here in Boston there was a distillery located over by the North End at 529 Commercial Street with a 50-foot-tall, 240-foot-wide tank that contained 2.5 million gallons of molasses. The stored molasses was supposed to be transferred to a plant situated between Willow Street and what is now named Evereteze Way in Cambridge. Suffice it to say, it never got there. Can you just picture this scene? It’s awesome in its scope and destructiveness. It’s like a good disaster movie — The Day After Tomorrow, for example. I mean, the story is real and dramatic, and yes, I know people lost their lives, but how cool does that sound?!? People, we’re talking a fifteen-foot-high wall of molasses!!! Why hasn’t there been a movie made about this yet? 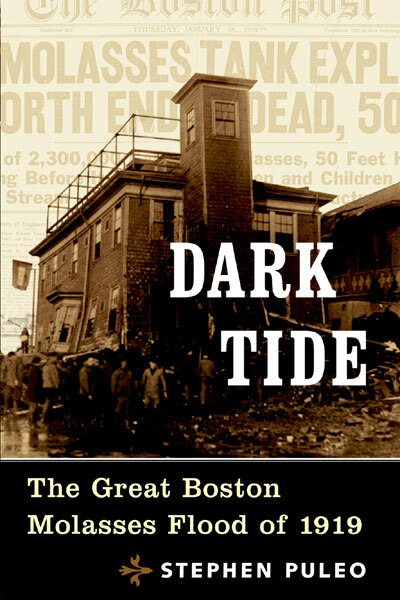 There’s even a book that came out in 2004 that provides the perfect title: Dark Tide. No kidding. It’s really called Dark Tide! That’s genius! Jerry Bruckheimer, are you reading this? I hear no less than Nicolas Cage is standing by, ready to take on the leading role. So because this is one of my favorite stories, tragic though it is, I wanted to post something here to commemorate the anniversary.